(Wikipedia); The American white pelican rivals the trumpeter swan, with a similar overall length, as the longest bird native to North America. Both very large and plump, it has an overall length of about 50–70 in (130–180 cm), courtesy of the huge beak which measures 11.3–15.2 in (290–390 mm) in males and 10.3–14.2 in (260–360 mm) in females. It has a wingspan of about 95–120 in (240–300 cm). Based on their size you can see why landing takes a little room. 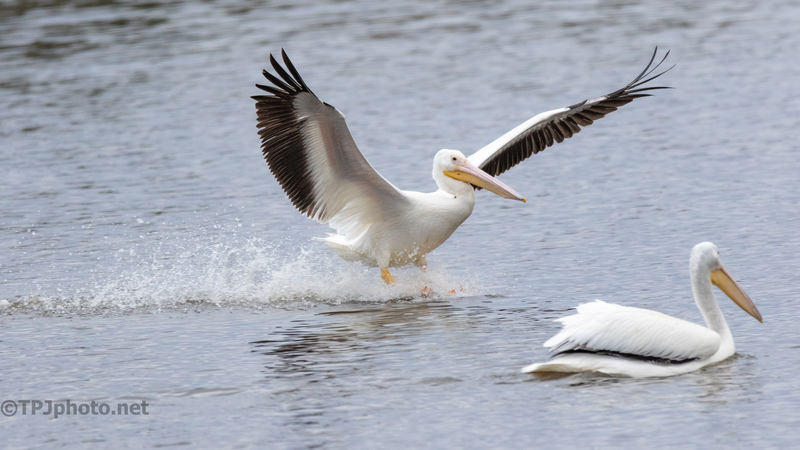 The most interesting photographs of White Pelicans is when they land.